In a few months’ time, Kaikoura residents will celebrate the return of their nationally endangered Hutton’s shearwaters from Australia’s fishing grounds with a raucous street party. Volunteers feeding ‘sardine smoothies’ to the some of the chicks on the new site. Indeed, these welcoming parties are becoming quite a tradition amongst birders in NZ. Church bells toll and cake flows when our godwits return from their marathon flight from Alaska. And although the celebration is just as lively in Kaikoura, emotions run a little higher because locals are hoping some of the returning shearwaters will choose their fenced man-made site on the peninsula. The good news is that more and more birds are coming back to this site each year. In 2012/13, twenty one birds returned and two chicks successfully fledged from this 2.1 hectare predator-proofed sanctuary. Hutton’s Shearwater Charitable Trust member and DOC Biodiversity Programme Manager, Phil Bradfield says that he expects these chick numbers to increase because these birds are still learning how to parent and more translocated birds are returning every year. In 2010, there were a few face-palm moments, as volunteers found eggs laid by young inexperienced birds on the bare hillside rather in one of the 150 specially-designed burrows however Bradfield is confident they will master egg-laying in the coming years. To establish this third safe breeding site, there have been five translocations of about 500 birds from the mountain-side site on the snowy hills of Kaikoura to this new site. 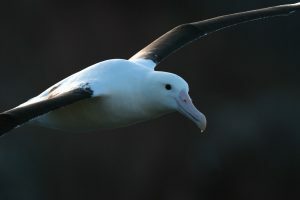 Back in the mid-1960s, Hutton’s shearwaters had eight breeding sites in the Seaward Kaikoura Range but this was reduced to just two sites due to predation and habitat loss. Two major risks were identified with the larger mountain-side site – the invasion of pigs or a catastrophic landslide. So as a safeguard, it was decided that a third new site should be established. Their new home – a piece of farmland overlooking the ocean that lies 15 minutes from town – was chosen because it was the perfect take off ground for Western & Northern Australia. After planting the land in tussocks and installing 100 artificial burrows, the ground was ready to receive its first feathery inhabitants back in 2005. Timing is crucial to the success of seabird transfers, so before the chicks had a chance to imprint on their mountainside home, they were plucked from their burrows and flown by helicopter onto this peninsula site. Teams of volunteers took on the role of the parents and fed the chicks sardine smoothies before they departed for Australian shores 3 months later. Photo: The team helicopter the Hutton’s shearwater chicks to their new home. Photo: Hutton’s Shearwater Trust. The group then waited, and waited. These birds typically return to NZ to breed when they are 2-3 years old. By broadcasting their calls, the team managed to get these teenage chicks to return to this new site in 2008. However the success of the project was marred by wild cats in the area that chomped their way through the chicks and returning adults, so the Hutton’s Shearwater Charitable Trust was established in 2008 to raise the $250,000 needed to build a predator proof fence. After its erection in 2010, the team has seen an upward swing in numbers – and with a carrying capacity of up to 10,000 birds it is nowhere near full. Bradfield says this is a project that requires patience, and it’s this slow and sure method that will allow them to test whether other species can be placed behind these sanctuary walls. At the moment, the ex-farmland is unsuitable for burrow-creation because it has been impacted by the hooves of cattle that previously occupied this land. However the vegetation, the worms and the microbes are doing fine work of breaking up the soil to create loose topsoil, so these birds and perhaps other species such as local and endangered lizards may occupy it in the near future. The project team – which includes Hutton’s Shearwater Charitable Trust, DOC, Tukete Charitable Trust, Kaikoura District Council, Te Runanga O Kaikoura, Landowners and Forest & Bird – has a number of species on its wishlist but the focus for now is firmly on this robust little seabird. This tiny 350g seabird has interestingly become a local icon and the efforts to turn around its plight have been an incredible community-building exercise. The giant fundraising effort, the sardine-smoothie making, the welcome parties, the constant monitoring and the general mollycoddling is performed by a team of dedicated volunteers. And now that this colony has started to establish itself, these mountain refugees are attracting the attention of not only volunteers and locals, but also tourists. There’s even talk of people walking to the new colony at night on the existing Kaikoura Peninsula Walkway during the breeding season so they can get a close look at this cacophonous new colony that’s exciting local residents no end. 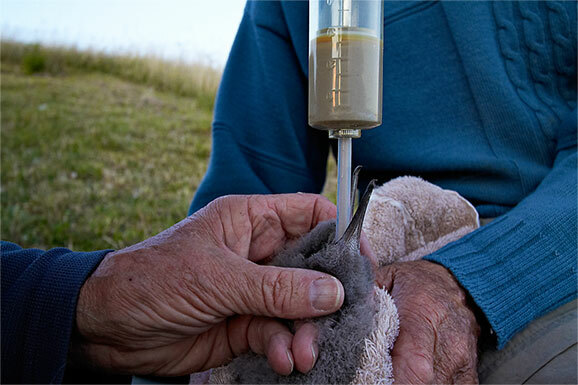 The Hutton’s Shearwater Charitable Trust is especially grateful to the Tukete Charitable Trust for allowing this project to take place on its Kaikoura Peninsula land and to Te Runanga a O Kaikoura for ongoing support of this project.